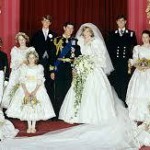 If you’re my age or older you’ll remember the wedding of the century – Princess Diana and her meringue dress (forget Prince Charles, it was all about the dress) with mutton leg sleeves! 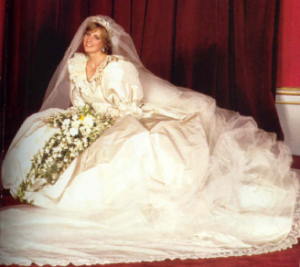 According to the trashy book I just read ‘Wedding Babylon: Confessions of a Wedding Planner’ the iconic dress became world famous accidentally. Vogue magazine faked an article about wedding dresses, asking loads of designers to send in sketches for a target audience of young country brides – not the most popular girl of the moment. Apparently off the back of this Elizabeth and David Emmanuel stole the job from some of the bigger names. 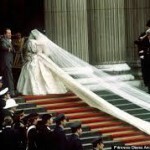 The craziest thing was not that we all thought it was the most amazing wedding gown (of the time) – but the over-the-top 25 foot train which the bridesmaids must have had a lot trouble arranging. And then Brides for almost the next decade all brides wanted to be a Princess and meringue dresses and stupid puffy sleeves were seen everywhere!